Lady Pirate Paige Noyes practice hitting the volleyball. 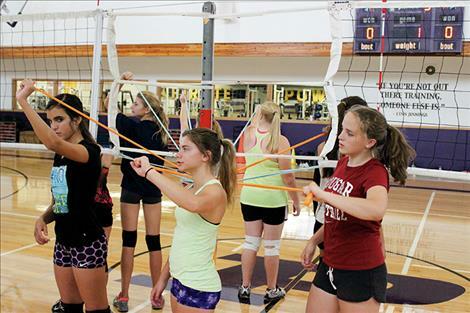 Lady Pirate volleyball team members do arm strengthening exercises. 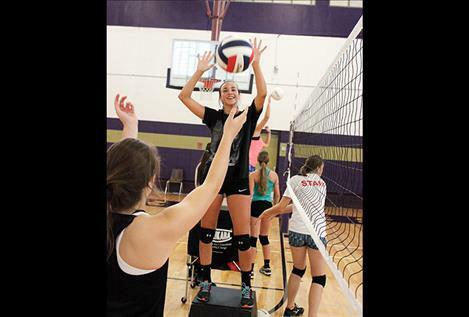 POLSON – With four returning seniors, the Polson Lady Pirates are hoping for a strong offensive showing in the 2016 volleyball season. Second-year Head Coach Patty Luetzen lost her top defensive line, but preseason practices look promising in this area. After losing All-Conference libero, Lydia Dupuis and defensive backs Shawna Lenz and Marlee Congdon, Luetzen was worried that she wouldn’t find replacements. Returning to the gym last week, Luetzen was impressed with juniors Laurel Bitterman and Kyler Lundeen, who were eager to fill leadership roles. “These two girls had the physical talent already, but have stepped up their communication responsibilities,” Luetzen said. In addition, senior outside hitters Chadelle Smith and Haley Fyant will be adding back row responsibilities to their game. 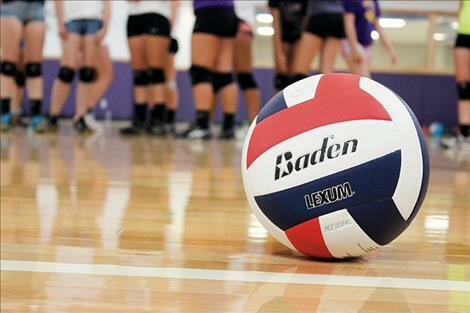 “These two girls have shown me in preseason that their ball-handling skills are as important as their already proven hitting skills,” Luetzen said. Rounding off the top players are returning senior middle blocker Lauren Lefthand, outside hitter Hannah Fryberger, and junior setter-hitter Kaelyn Smith. 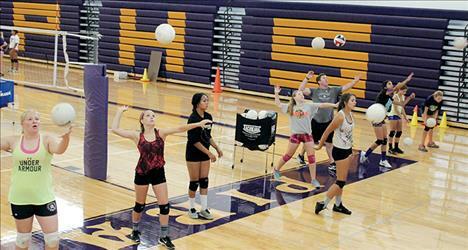 The Polson Lady Pirates start their season with a tournament this coming weekend, Aug. 26-27, in Whitefish.